EURUSD Weekly Outlook: More Volatility Likely, But Can The Pair Finally Break Out? Technical Outlook: Near term indecisive, longer term clash of momentum and resistance, link to report on what will determine the outcome. 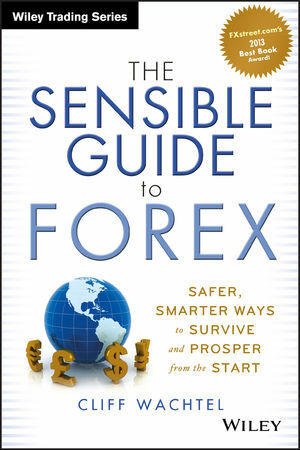 Fundamental Outlook: Neutral Near Term, Bearish Longer Term & What’s Driving The Continued Trading Range. Conclusions: Likely trading range, drivers, & catalysts needed for breakout as conflicting trends converge. Overall risk appetite per sample of weekly charts for leading global stock indexes shows virtually no change from the prior week. European indexes have lost their upward momentum, closing again in the double Bollinger®band neutral zone, and also showing flat 10 and 20 week EMAs. Once again we clocked yet another indecisive ‘doji’ candle this week on the S&P 500 (the third in 5 weeks) and also in most of our other US and European indexes. We continue to see a clash of bullish upward momentum versus long term bearish resistance at the 1.386 area, comprised of the price level, the downtrend line, and the 61.8% Fibonacci retracement line prior EURUSD downtrend of 2011-2012 that ended with Draghi’s OMT program announcement and the calming of fears about Spain’s banks. Of all of our sample global weekly index charts, the pair continues to track the S&P 500 best. The daily chart showed a steady rise this week in the EURUSD. We don’t present it because the overall progress was minimal and thus it sheds no additional light on the pair for anyone but very short term traders. NB: The green converging trend lines show the long term downtrend line from August 2009 converging with the uptrend line from June 2012. These contrasting trends will soon converge, suggesting a coming breakout. See our report on the EURUSD’s Q2-Q3 fundamental outlook (coming soon) for the likely direction of the next breakout. The pair tends to move with risk appetite as reflected in the major US and European stock indexes. These continue to trade within a narrow range, so there has been no sustained pressure up or down from these. Last week the EURUSD tracked the S&P 500 well, with both making minor moves higher that brings both back to the lower edge of their double Bollinger band buy zones, suggesting rising odds of a break higher the coming week’s events (see below) are supportive. As we discussed in some depth last week here, the relative fundamentals for both currencies remain in equilibrium, with no changes in outlook for their underlying economies or for their central banks’ policies expected in the coming weeks. Longer term most agree the ECB is moving towards EUR-bearish easing, but probably not before June, as noted below. The Fed is slowly tightening via its $10 bln/ month cuts in its QE program, but that’s already priced in. Actual increases in benchmark rates are not expected before April 2015, to the extent that you trust forecasts of events 12 months away. Thus the pair has gyrated within the 1.368 – 1.393 range for the past 11 weeks, and within the even tighter 1.378 – 1.39 for the past 2 weeks, moving a bit with the day’s leading news events, none of which have been influential. –ECB attempts to jawbone down the EUR have had little influence over the pair beyond the day of the latest comments. –The same goes for economic data, and earnings announcements, all of which have been mixed overall, and even the recent uptick in US data will need to prove persistent in order to bury doubts about the US recovery from the past winter’s weak data. –Russia-Ukraine tensions have thus far evoked a collective yawn from markets, for reasons we detailed Fools Russian: 1 Chart Shows How To Play Russia Tension-Related Selloffs. This week, most of the big fundamental drivers come from the bevy of top tier US data releases, led by Q1 GDP, an FOMC rate decision, and US jobs reports on Friday, along with the earlier reports like the ADP non-farms payrolls that serve as leading indicators for the big Friday result. Despite the potential drama, and likelihood of a wider trading range than seen over the past 2 weeks’ 1.378 – 1.386 range, the odds are low for the kind of big surprises needed for a breakout beyond the past 11 week’s 1.368 -1.392 range. GDP is a lagging indicator that’s usually well anticipated and already priced in. There’s nothing in the coming week’s data to suggest a change in Fed policy and thus a hawkish Fed policy revision that would support the USD. The Fed is widely expected to continue its modest taper of $10 bln/mo. The US jobs reports are expected to continue to show slow but steady improvement, which would be in line with the general theme of recent US data. Given the FOMC’s dovish bias, it would need to see a major surprise from the jobs data (like beating forecasts by ~20%+) to stir any speculation of faster tightening that could send USD benchmark rates, and thus the USD, higher. Even if job figures disappoints, the Fed is unlikely to slow the taper’s pace. As we discuss in our special report here, there’s considerable evidence that the Fed’s ability to support jobs growth is largely exhausted. There’s no press conference scheduled after this month’s FOMC meeting. Meanwhile, there’s very little top tier European data to move the EUR, as noted below under Top Calendar Events. Beyond next week’s U.S. economic reports, the big wildcard is whether we see an escalation in the conflict between Russia and Ukraine, because that has not yet been priced in. If Russia invades Eastern Ukraine, we could see a deep sell-off in currencies and equities on uncertainties about the effects of yet a new round of sanctions. We still see such selloffs as buying opportunities for those with medium-long term time horizons, as detailed in the above noted report, but in the shorter term selloffs could easily come, with the EUR more likely to suffer than the USD. 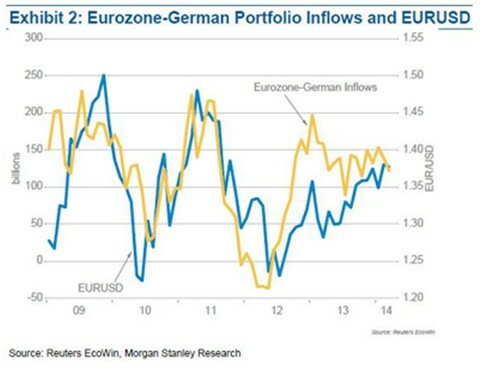 As the below chart suggests, continued inflows to EUR denominated assets, ranging from riskier GIIPS bonds to more conservative German assets, continues to provide a bid for the EUR despite threats of coming ECB easing, Russia-Ukraine tensions, and of new EU crisis flare-ups. 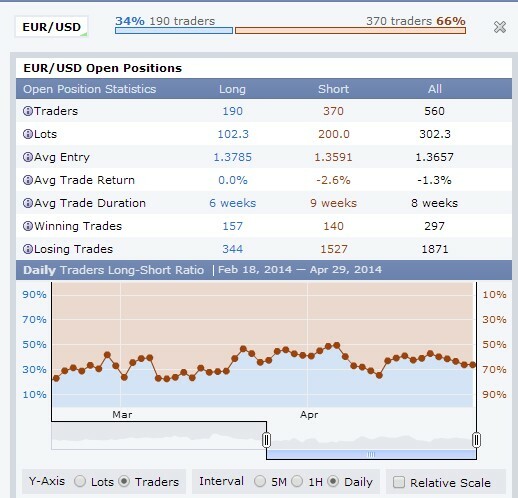 The real time retail trader sample of EURUSD long/short positions, 34%/66%, is slightly more bearish than last week’s 39%/61%, similar to the speculative position change shown by the most recent (last Tuesday) COT report on speculative positioning. This week’s calendar is heavy on top tier US data, light on other top tier data from the biggest economies, and almost devoid of top tier EU data, so the pair moves with US reports and overall risk appetite. Earnings season has thus far been mixed, and usually by this fourth week that theme is set and so earnings lose much of its market moving potential. US: Pending Home Sales: -0.8%/1.0%. Despite all the concern about jobs, in the end of the day US GDP will benefit only when job and wage growth translates into actual spending, and housing is a huge driver of both jobs and spending. Some believe last month’s ugly figure was an outlier. We’ll find out this week. A rebound in housing data will go a long way to supporting the US recovery story. Advance GDP:-2.6%/+1.1% Like all the major US data releases over the next month, these are critical for either confirming or dispelling the excuse that early 2014 weakness was due mostly to temporary weather conditions. Strong results not only reaffirm the US recovery, they also feed expectations for an additional data boost as deferred spending adds to coming data. FOMC Statement: Important only if it changes market perceptions (correct or not) about Fed policy. No changes expected until we see a sustained change in US data. Chicago PMI: 55.9/56.6. The jobs component of this manufacturing index may influence sentiment about the Friday BLS report. China: Manufacturing PMI: Important for overall risk appetite and the only important report until Midday EST given that most of Europe is on bank holiday for labor day. US: ISM Mfg PMI is the big US data release, with focus on its jobs component as a leading indicator of the Friday BLS jobs report. Other potentially top tier market moving events: Fed Chair Yellen speaks, matters only if she surprises markets about policy direction. US weekly new jobless claims 329k/317k, personal consumer expenditure. 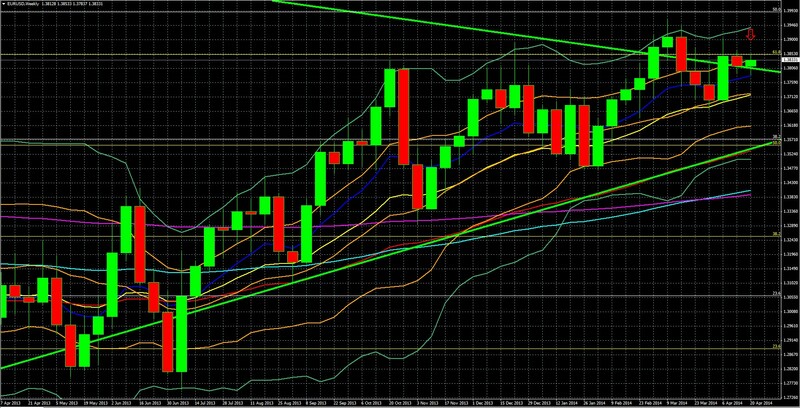 The pair is unlikely to break out from its 1.368 – 1.393 range of the past 11 weeks. This week’s calendar has enough top tier events to allow for a greater trading range than the tighter 1.378 – 1.39 for the past 2 weeks. Despite threats from Russia and eventual ECB easing, continued low USD rates and capital inflows into GIIPS bonds and other EUR-denominated should keep that 1.368 support level solid in the near term. The converging long term downtrend and uptrend lines suggest a coming end to this trading range and the start of a new trend. See here for our outlook on the EURUSD’s fundamental drivers for Q2 and Q3.